This Tag Set features DRESSED Dolly Dingle Vintage Paper Dolls on Colorful Retro Backgrounds with Coordinating Bicycles as a Reminder of Wonderful Childhood Summer� Pleasures! The Tags �would be great additions for a Paper Bag Album, handmade Greeting Card,or any Altered Art or Scrapbook application.��Raw Graphics with Kind Permission of� Sheila Reid. You will receive the download in a Zip File within 24 hours of receiving payment. This is a Seneca Pond Crafts exclusive design, and no commercial licensing is required, except you may not resell or share�the Digital Files.�Enjoy! 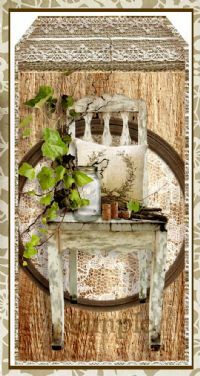 This Tag Set features a Wood Grain Background, Burlap, Lace, and a Collection of Primitive Farmhouse Ephemera showcased within a Worn and Weathered Embroidery Hoop. Each Tag Is unique. The Tags would be great used as ornies or as additions to Gift Packages, a Journal, handmade Greeting Card,or any Altered Art or Scrapbook application. Raw Graphics with Kind Permission of Susan Darter. You will receive your download in a ZIP File within 24 Hours of submitting your payment. This is a Seneca Pond Crafts exclusive design, and no commercial licensing is required, except you may not resell or share the Digital Files for others to print out. Enjoy! 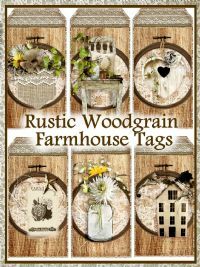 Each of these Grungy Vintage Primitive Tags is filled with Country Home Images on a Hinged Distressed Wood Board with Coordinating Word Art. The Tags would be great addition for a Journal, Paper Bag Album, handmade Greeting Card,or any Altered Art or Scrapbook application. Raw Graphics with Kind Permission of Susan Darter. You will receive the download in a Zip File within 24 hours of receiving payment. This is a Seneca Pond Crafts exclusive design, and no commercial licensing is required, except you may not resell or share the Digital File itself for others to print out. You may, however, sell the tags as physical, tangible products if you print and assemble them yourself. Enjoy! Each of these Primitive Collage Tags has one of two Different Hartwarming messages. First - A FAMILY IS A PATCHWORK OF LOVE; Second - A FAMILY STITICHED TOGETHER WITH LOVE SELDOM UNRAVELS. The Tags would be great added to a Dollie or a Pin Cushion or used for a Journal, Paper Bag Album, handmade Greeting Card,or any Altered Art or Scrapbook application. Raw Graphics with Kind Permission of Susan Darter. You will receive the download in a Zip File within 24 hours of receiving payment. This is a Seneca Pond Crafts exclusive design, and no commercial licensing is required, except you may not resell or share the Digital File itself for others to print out. You may, however, sell the tags as physical, tangible products if you print and assemble them yourself. Enjoy! These Retro Chic Camera Tags include a Mat for adding your own Photos from the BEST DAY EVER event that you would like to share with Farmily and friends. The Tags would be great for a Journal, Paper Bag Album, handmade Greeting Card,or any Altered Art or Scrapbook application. Raw Graphics with Kind Permission of Pixel Scrapper. You will receive the download in a Zip File within 24 hours of receiving payment. This is a Seneca Pond Crafts exclusive design, and no commercial licensing is required, except you may not resell or share the Digital File itself for others to print out. You may, however, sell the tags as physical, tangible products if you print and assemble them yourself. Enjoy!